One of the top reasons to visit Cuba is to learn about its fascinating history and see how that history affects everyday life. But before we dive into that, here’s one brief Cuban history lesson for you: In the 1950’s, brothers Fidel and Raul Castro led a guerilla army in the overthrow of the Fulgencio Batista government – what is known today as the Cuban Revolution. In the years following the success of the Cuban Revolution, Cuba’s new government implemented a series of reforms centralizing the economy. For several decades, every business in Cuba (from major agricultural operations to hair salons) was run by the government. By the 1990’s, however, the Cuban economy spiraled into crisis following the demise of its major trade and aid partner, the Soviet Union. In response to the crisis, the Cuban government has spent the last two decades slowly opening back up its economy to small private businesses and international tourism. While the majority of the economy is still centrally controlled, Cuba now has a burgeoning private sector comprised mostly of Cubans who have converted their homes into restaurants or bed and breakfasts. So what does this mean for your Cuban vacation? 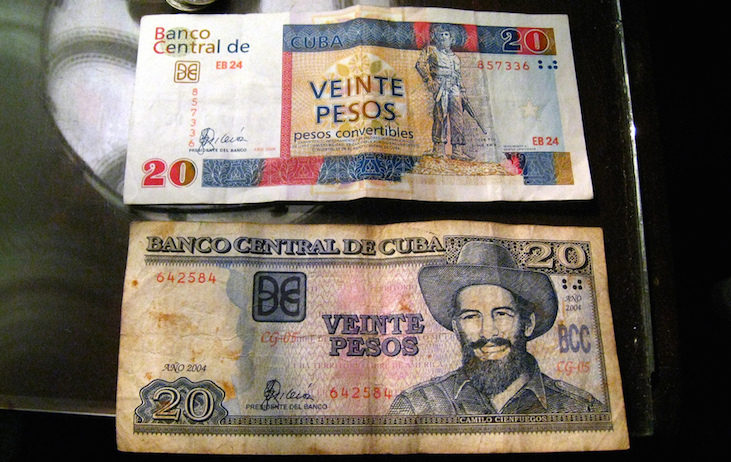 Cuba has two currencies: the Convertible Peso (CUC) and the Cuban Peso (CUP). That’s right! Cuba is one of the only countries, if not the only country, in the world that has a dual currency system. The colorful CUC is valued one-to-one with the U.S. Dollar, and was created in the 1990’s as a hard currency that could be used on the international market. The CUC is what you’ll use for nearly all transactions in Cuba, including paying your hotel bill and going out to eat in a paladar (restaurant that is inside a Cuban home). Cuba’s other currency, the CUP, is worth just 1/24th of the CUC, and is what Cubans use in their everyday lives to pay their utility bills and stock up on guavas at the farmers market. So, how on Earth are you supposed to tell the difference between the two? The best way to tell the two currencies apart is to ask yourself, “Does this bill have a face on it?” The bills with the faces are the lesser-valued CUP – in other words, NOT the bills you want! However, the Cuban government has vowed to unify the dual currencies the year and the result of this will be losing the CUC, or the more highly valued currency. So be sure to ask your insightCuba travel specialist about the status of this process before you go! It's like traveling back in time.